Collaboration across the supply chain is reaching new levels of success, with the doubling of Ultra Sites registered with the Scheme in less than 12 months since their formal launch. Ultra Sites are the model of best practice for the industry to improve not only their own performance but that of the wider construction industry, particularly through their supply chain. 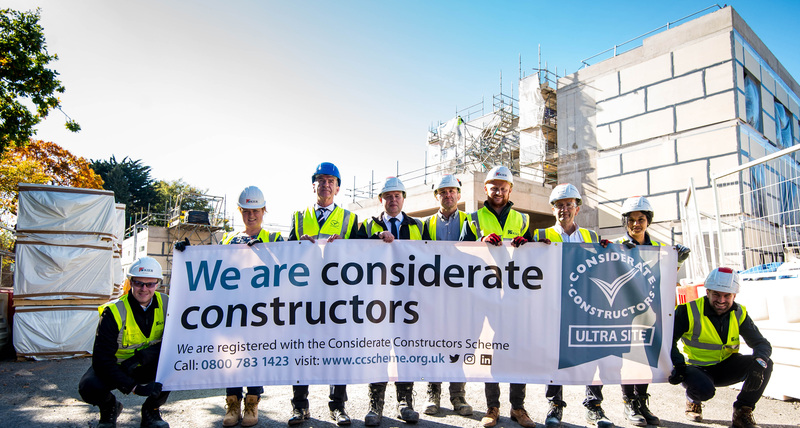 The rapid growth of construction sites making this ultimate commitment to considerate construction reinforces how becoming an Ultra Site is the mechanism to achieve top-performance in total supply chain collaboration. Currently, there are 26 live Ultra Sites throughout the UK, ranging from billion pound sites, including the largest infrastructure project in the UK, to small housing developments delivering 39 units. This range in the types of sites which are making this commitment reinforces how any site, no matter what size and scale can become a beacon of best practice across the construction industry. In July 2018, the Scheme hosted its inaugural National Ultra Site Awards to recognise those Ultra Sites which achieved the highest level of standards with their supply chains. Eligible sites included those that formed the consortium of the 24-month pilot of the Ultra Site initiative, before its official launch. It is abundantly clear how much value those who are part of Ultra Sites are receiving; not only in how they work more effectively together but also in gaining greater efficiencies right across the supply chain. The tangible benefits to both the principal contractor, supply chain and the client have resulted in sites which are operating at the highest standards of consideration. We’re delighted how our industry has responded to Ultra Sites, and the rapid growth of those signing up shows how our industry is increasingly taking the necessary steps to work together throughout the supply chain. We look forward to recognising outstanding Ultra Sites through our second National Ultra Site Awards later on this year, and the continued growth of this essential way to achieve best practice in collaboration.